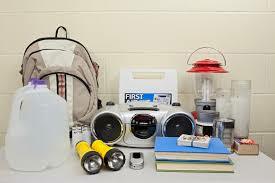 September 6, 2013 — September is Emergency Preparedness Month! Throughout the month there will be activities across the country to promote emergency preparedness. More than 3,000 organizations – national, regional, and local public and private organizations – are supporting emergency preparedness efforts and encouraging all Americans to take action. Would you be prepared if a disaster, natural or man-made, happened today? At Operation USA we understand that preparedness makes a big difference when disaster strikes! Take a moment to familiarize yourself with these recommendations from the CDC to ensure that you and your family know what to do in the event of an emergency. Stock up on water, perishables, first aid supplies and anything else you might need if you lose access to food, water and electricity. Some items to include: hand-crank radios and flashlights, medications, a multipurpose tool, copies of important documents, family contact information, blankets, extra clothing and activities for children. Make a plan with family and friends in case you are not together when disaster strikes. Determine where you’ll go, how you’ll contact each other and possible scenarios you may encounter. It is a good idea to have a family “point person” — someone who lives in a different location that all family members can contact if separated during an emergency. Pay attention to different kind of media (online, TV, radio) to find out what to do in the event of an emergency, and to understand what is happening locally, nationally and globally. Prepare yourself for an emergency by proactively learning skills that may be useful to you when disaster strikes, such as CPR and first aid. Work with others in your community to make sure everyone is prepared for possible emergencies, and develop a community-wide plan. For more information on Emergency Preparedness Month, check out the CDC website here. Then, be sure to join us on Facebook and Twitter for more tips and helpful information throughout September. Visit our Facebook page now to learn how you could win great prizes from Industrial Revolution!